Other than DNS servers which provided by the ISP (Internet Service Provider) to resolve domain names to IP addresses so that web browsers knew the network path to retrieve and download websites’ content, there are plenty of free public DNS server (Domain Name Server) which available for end-users’ use. As a result, end-users can change to different DNS servers in order to make web browsing faster by resolving the web address faster. In addition, some DNS servers provided by ISP can be unreliable, overloaded, slow, prone to downtime and timeout when resolving domain names, causing web browser unable to display web pages or slow loading and opening of web pages. Internet visitors can optimize the DNS servers configuration setting of the system by using the fastest and most reliable DNS servers. To make the optimum setting on DNS settings, a measurement of speed and reliability of DNS servers should be done, and there are several software utilities that able to automate the process to test and measure performance of DNS servers, such as NameBench and the more advanced GRC DNS Benchmark. DNS Benchmark gives user visibility into what’s going on with the system’s currently assigned DNS servers by automatically comparing their performance with many well known publicly available alternatives. The DNS Benchmark performs a detailed analysis and comparison of the operational performance and reliability of any set of up to 200 DNS nameservers or resolvers at once. By default, the tool identifies all DNS nameservers the user’s system is currently configured to use and adds them to its built-in list of publicly available “alternative” nameservers. The the whole list of DNS nameservers is characterized, measured, charted, statistically analyzed, and reported its performance. The characterization includes testing each nameserver for cached lookups, uncached lookups, dotcom lookups, reliability, rebinding protection and its “redirection” behavior: whether it returns an error for a bad domain request, or redirects a user’s web browser to a commercial marketing-oriented page, which may be objected by many people. 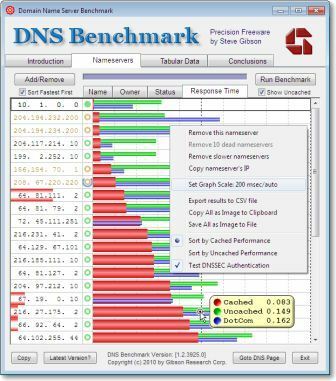 DNS Benchmark is standalone application and available for free. No installation is required, and using the software is as easy as clicking the “Run Benchmark” button. While the results may be very detailed, and DNS resolvers performance comparison can be easily sorted according to fastness, while the program also gives conclusions on the benchmark test.